If you really need to take a break from India, then Pondicherry is a good bet. Anthony and I had set our sights on this former French colony long before we came to India, but we weren’t sure how it had fared in the tsunami. It turns out that Pondicherry has a really high sea face below which lie stacks of treacherous black rocks and tetrapods. A few people died in Pondicherry. The town had some of the lowest numbers of deaths in TN, but it certainly would have been worse had Pondy not had such a reinforced wall. Even a few weeks later, high tide looked menacing ? but I suspect that is how it always is. 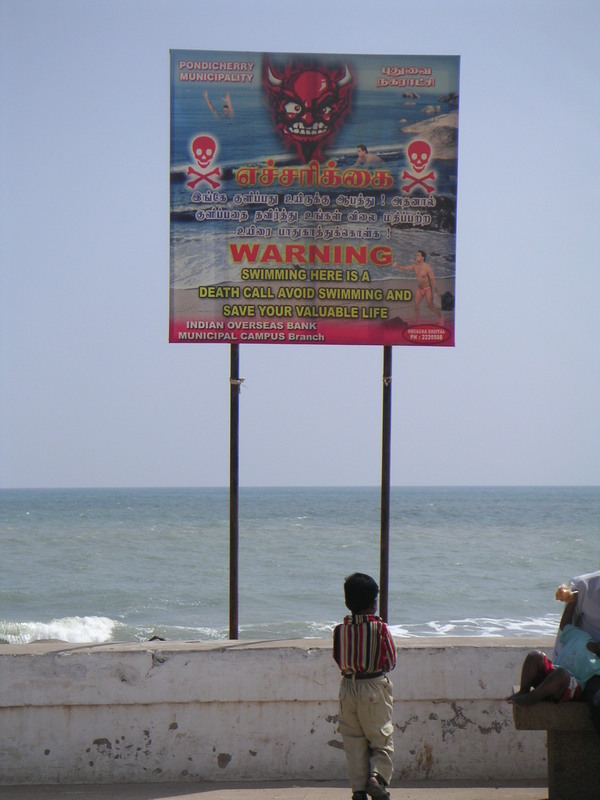 Posters that appeared to be several months to years old warned swimmers about the Devil Sea. Despite all of this, Pondicherry’s shore proved to be one of the most beautiful I’d seen in India. Waves crashed on the rocks and sprayed up on the well-swept promenade, where families sat on benches and enjoyed the mild January air. Of course, it wasn’t until dusk that the air was cool and the sun bearable. Pondicherry was also one of the hottest places I’d been in months. So, when we arrived at around 11am on a Saturday, it seemed most people were holed up in their homes taking a siesta from the mid-day heat. We could have been just as easily in St. Martin. Other signs pointed to the fact that this had been a French outpost. 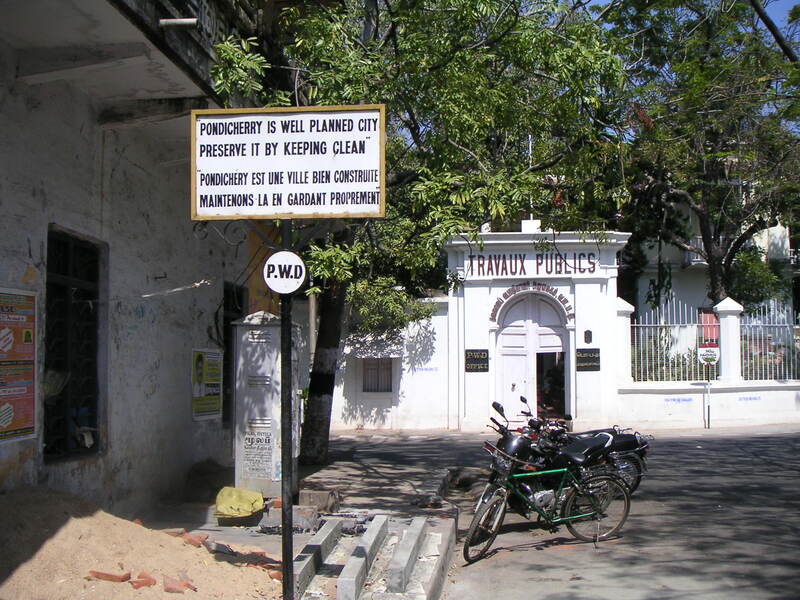 Pondicherry’s unfortunately named Ville Blanche (“White Town,” as opposed to “Black Town” on the other side of the “tracks”) had street signs in English and French, urging citizens to “maintenons la en gardant proprement” (help keep the city clean). If you’ve been anywhere else in India, you’d know what an anomaly such a sign is. Indian homes are immaculate, for sure, but the streets are often left to be tended by the cities, which invariably never get around to doing anything. Pretty churches are not uncommon, and Pondy’s seemed well-attended and maintained. We paid a visit to Sacred Heart, a towering cathedral, and Notre Dame des Anges, an elegant peach-and-cream church opposite a Joan of Arc statue and the sea on Rue Dumas. It was in such a prominent position, we were surprised it wasn’t mentioned in our guide book. Something else for the not-so-forthcoming guidebook: you can get some great street coffee from a shack of a vendor just around the corner from Notre Dame. Coffee, more so than chai, is the currency in Pondicherry. (Apparently, the lower classes once drank only tea while the Brahmin and colonizers drank coffee.) So, it was delicious and cheap. Food also was a revelation. While I’ve grown to love curries, tandoori, and Bombay chaat, I was happy to have the option of ordering organic salad and fresh pasta. Farm-style pat?, anyone? Unfortunately, while I was happily ordering at Satsanga	, I was reminded of the recent tragedy: seafood was not available as the local fishermen were still too frightened to venture out to sea. In the middle of the day, it was refreshing to sit in Satsanga’s garden and drink Kingfisher beers while we waited for the heat to abate. Unfortunately, that would be the only tall, cold ones we’d have on the trip as it was a holiday (rather, holy day) and the city’s taps were required to run dry for the night. People are much more religious in Tamil Nadu than other places I’ve been in India, and that Saturday was the birthday of Shri Shri someone-or-other. It likely was the birthday of one of the leaders from the Aurobindo Ashram, the cult-like yoga and inspired living commune that does more than its part to keep Pondicherry (and neighboring new-age village Auroville) on the yuppie map. Aurobindo’s presence was pervasive, but I suppose I can thank it for the proliferation of funky art shops, antique colonial furniture boutiques, and the boulangerie ? not to mention the tidiness near the municipal buildings and the shore. After a very satisfying lunch, we wandered around the city some more, and over to the Ville Noir, and came across the city’s main temple. It was also the Pongal holiday, which was more likely the reason for that day’s no-alcohol policy. It was also the reason why a lively fair had cropped up by the temple. Though Pondy was hardly crawling with tourists, we were happy to find that the temple area was mostly void of them, too. An elephant, whose melancholy glance was far-too-human, stood outside the temple with his master, blessing passers-by with his trunk. Anthony and I bought some wheat grass and bananas from the vendor opposite and jockeyed for position. Fearlessly, I stood in line for blessings three times. I’ve become an old pro! Dusk came quickly in Pondicherry ? it was winter after all ? and suddenly it was light-jacket weather. We joined other tourists and plenty of locals for a stroll along the shore and took the requisite photos of the Gandhi Memorial. By nightfall, a small carnival was underway mere steps from the shoreline. And it’s hard to say whether the palpable joy of the children and families in attendance was in spite of the recent disaster or because they survived it.